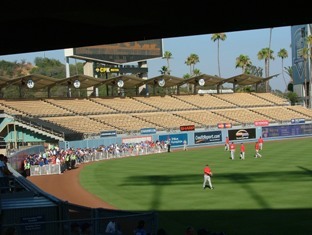 During batting practice, they open part of the outfield for fans to stand. 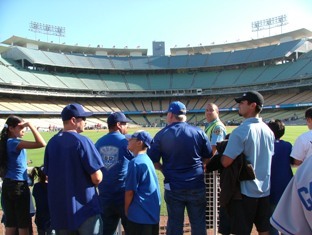 Where the fans are standing on the outfield warning track. 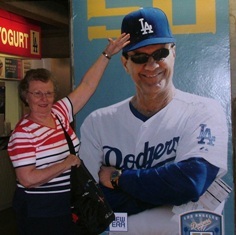 Ballpark onion review.... REAL onions, but I don't like these dispensers... Ah, well - REAL onions. 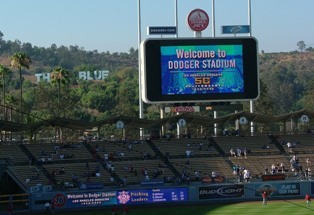 Welcome sign with "Think Blue" on the hill behind. 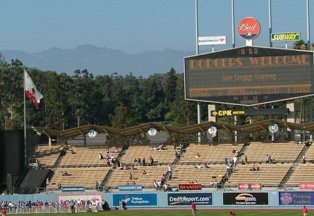 The views are just great here. 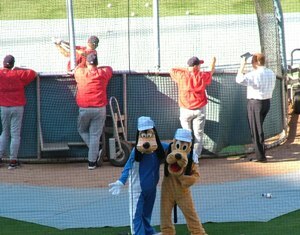 The Angels brought Goofy and Pluto, who donned LA hats. 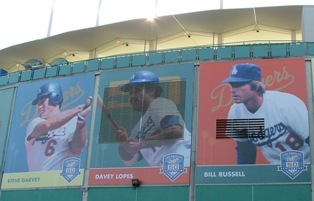 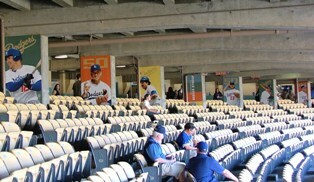 The stadium was covered with pictures of former and current players. 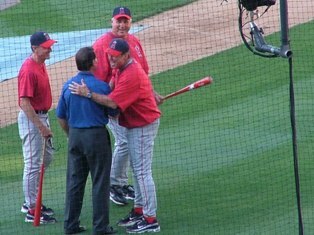 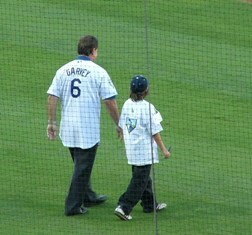 Mike Scioscia and coaches fraternizing! 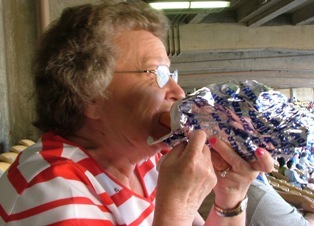 Mom enjoying a famous Dodger dog. 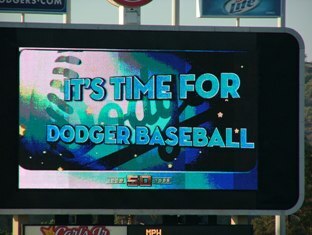 Enough pre-game stuff - let's play ball! 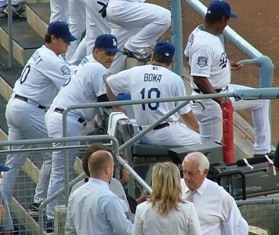 Joe Torre and Larry Bowa discussing the game. 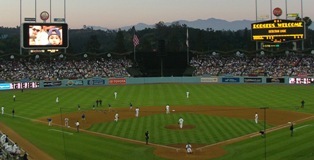 Game action - not too many base runners in this one. 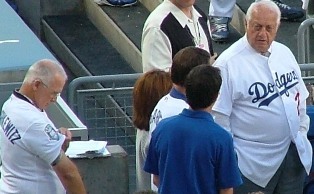 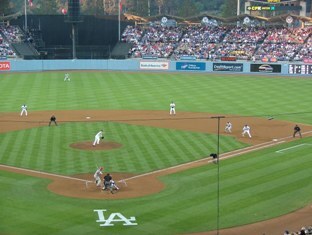 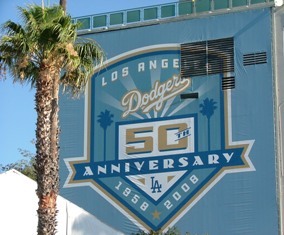 Dodgers won - without benefit of a hit. 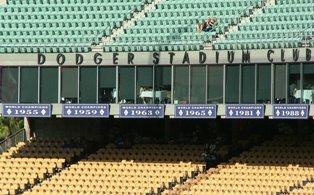 Only 5th time in ML history this has been done. 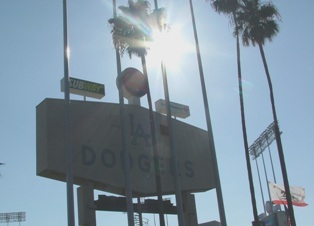 They sing the Randy Newman song "I love L.A." after a win. 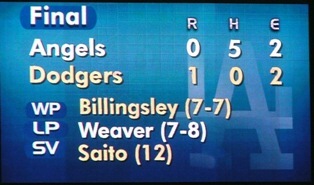 Weaver threw 7 no-hit innings, but still lost. 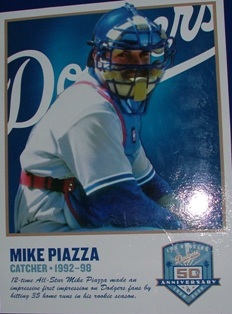 On our way out - finally the picture of Pizza-man!